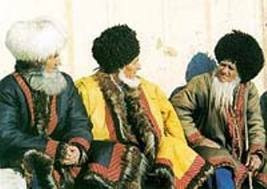 The formation of Turkmen national costume is connected with climatic conditions, occupation and historical relationship. The traditional Turkmen costume was free and loose clothing that was met all the requirements for the nomadic way of life. Man's costume consisted of a loose shirt, pants and robe, which were made of cotton fabric. The robe was made of striped fabric (silk), usually red, white and black stripes. Footwear was shoes which put on over woolen socks. According to shoes, one could determine the status of the host. Rich people wore boots made of white leather on the heel as well as boots with galoshes “kovush”. But the greatest attention was paid to the headdress “telpek”, as hat which was made of black, white and brown lamb was the sign of manhood. “Telpek” is a unique hat, it protects from the heat in summer and from cold in winter. It also was uncomfortable to wear “telpek” because of big size but in this case it was taken off, as there was a black head dress under it. White hats are usually worn by young horsemen, and black and brown are worn by old men . Women’s costume also consists of straight shirt (dress), pants, a robe and head dress. It remained the national originality of folk costume. 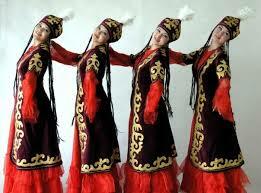 The dominant color in the clothing of Turkmen women is red. Woman’s shirt was sewn from red and crimson silk. Street clothes were robes "chabyty" and "chekmeny", made of dark blue, dark green or red silk fabric with white or yellow stripes. Festive robes were different from luxury embroidery. The main part of a married woman’s wardrobe was a robe "kurte" or "chyrpy", decorated with rich floral ornaments. Turkmen national costume was formed as a result of a long process of development of the spiritual and material, as well as the artistic culture of the Turkmen people.